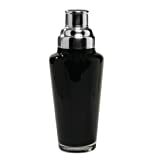 Mix up a fun drink with this cute black glass martini shaker! The base is made of glass and is fitted with a detachable metal strainer and cap. It is 10.5" tall and holds 25 fluid ounces. A fun piece of barware to add to your collection or give to a friend!